Today, Commodity Classic launched an all-new mobile app allowing attendees to access information, receive messages and engage in social media from their smart phones and tablets. The free Commodity Classic convention and trade show mobile app gives show-goers the ability to make their own schedules, lookup session, event and shuttle times, navigate with maps, fill out surveys, and much more. Visit www.commodityclassic.com/app. In less than two weeks, a record-breaking number of soybean, corn, wheat and sorghum growers from around the country will gather at the 19th Annual Commodity Classic in San Antonio, Texas for an experience that will educate, enlighten and entertain. From new product rollouts to thoughtful discussion of important agricultural issues-education is a key element of Commodity Classic. 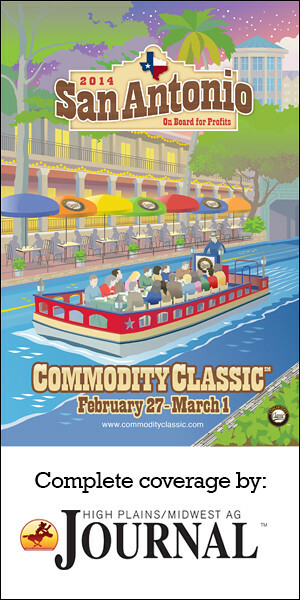 Commodity Classic is the largest farmer-run agricultural convention and trade show in the nation. Each year, acres of displays, equipment and technology fill the trade show floor and 2014 is no exception, with the largest trade show in the event’s history. Exhibitors bring their most knowledgeable people to Commodity Classic, giving attendees access to the best problem solvers in the industry. The event is presented annually by the National Corn Growers Association, American Soybean Association, National Association of Wheat Growers and National Sorghum Producers. The event offers a wide range of learning and networking opportunities for growers in the areas of production, policy, marketing, management and stewardship-as well as showcasing the latest in equipment, technology and innovation.